Carlsberg says its operating profit in Asia is increasing due to premium propositions growth. According to the first-half results, Asia region continued to deliver solid organic revenue growth (+4%) thanks to a strong 7% price/mix and despite a negative volume development in China. In addition, organic operating profit growth was a healthy 6%. Net revenue in Asia grew organically by 4% as a result of 7% price/mix offset by an organic volume decline of 3%. Reported net revenue declined by 4% due to a negative currency impact, mainly from China, Malawi, Malaysia and India. The solid price/mix was due to premiumisation efforts on local power brands, reduction of lowpriced products in China and growth of our premium propositions. The latter was particularly positively impacted by the Tuborg brand, which grew 17%. Asian markets had a mixed volume development. Carlsberg achieved particularly strong growth in India, Nepal and Laos, while its volumes in China declined following the market decline and closure of breweries. Organic operating profit grew by 6% and the reported operating margin improved by 60bp. The profit improvement was driven by Funding the Journey benefits, including positive price/mix, tight cost control and brewery closures in China. Chinese volumes declined organically by 8%, slightly more than the beer market. While Carlsberg gained market share in most of its key provinces, last year’s decision to restructure Eastern Assets and the subsequent closure of breweries resulted in a volume decline of approximately 25% in the affected provinces. Supported by the growth of our premium portfolio, notably Tuborg and Kronenbourg Blanc, price/mix grew by 6%. Profitability in China improved significantly due to tight cost control and the restructuring of Eastern Assets. In spite of the alcohol ban in the Bihar state as of April, the Indian beer market grew by an estimated 5%. Carlsberg Indian business continued to grow, delivering volume growth of 17% and price/mix improvement of mid-single digit percentages. Carlsberg Elephant grew significantly for the six months, and the Tuborg brand continued its strong growth trajectory. Profitability improved significantly. The Vietnamese market grew by an estimated 8% and we gained market share. Nevertheless, Carlsberg’s volumes declined slightly, due to stocking in Q4 last year ahead of the Têt festive season. The launch of Tuborg in northern Vietnam at the beginning of the year has delivered promising initial results ahead of plan. Volumes in Malaysia were impacted by the excise tax increase at 1 March. Price increases and good cost control ensured solid financial performance. Carlsberg business in Laos grew beer volumes while the water and soft drinks business was under pressure due to intensified competitive activity. 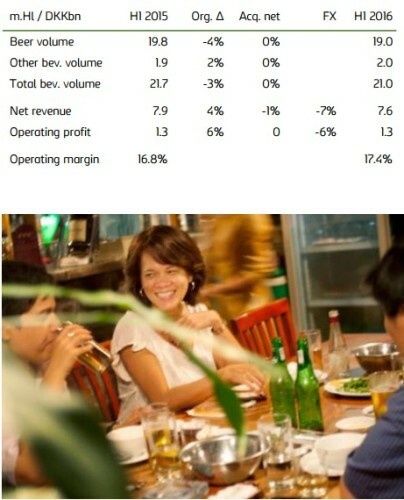 Profits and margins developed positively. Nepal delivered very strong performance due to market growth and price increases in addition to cycling easy comparables because of last year’s earthquake.